The NTC-3000 Series is a solution for cost effective deploymentin any data telemetry environment.Designed for reliable performance anduniversal installation itprovides 3G data connectivity for M2Mapplications enabling remotemonitoring, control, management and reportingof industrial and commercial equipment. It can also be used in SCADA (Supervisory Control and Data Acquisition)scenarios to monitor,control or collect data from remote devices such asfarm machinery, water monitoring devices and wind farms. A serial connection on one end and a 3Gc onnection on the other allows thedevices to simply take the serial data and send it over 3G. Whenconnecting through the RJ-45 port to the serial port of your device. 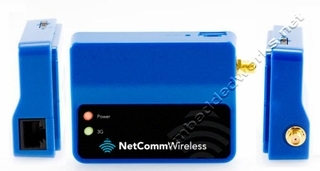 Themodemalso comes equipped with a Mini USB port where a connection canbe established through either a virtual COM port or SierraWireless's AirCard Watcher application. The lockable SIM tray w/ the rugged nature of the device means assured reliably, regardless of the physical location.